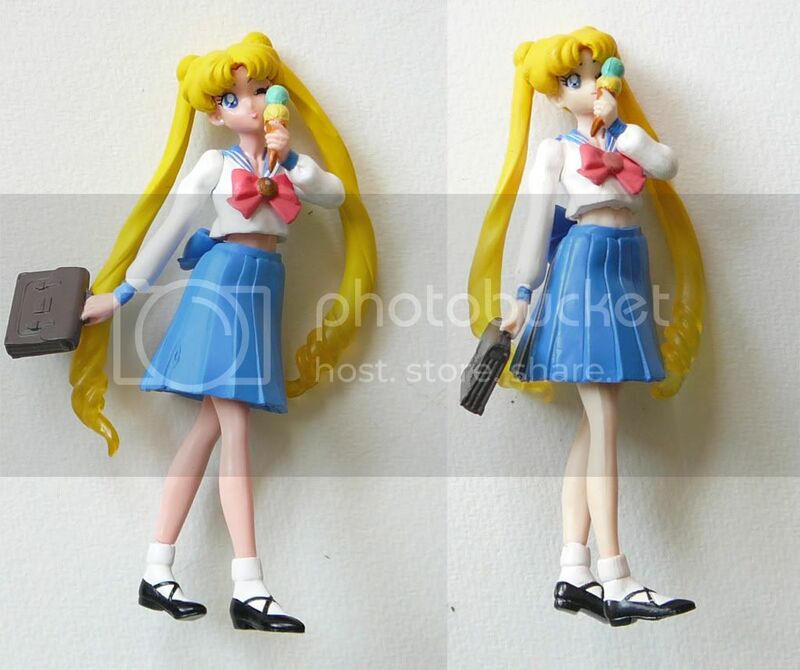 I have a few items for sale on my DeviantArt collection page including a Chibimoon keychain, some VHS, and a few gashapon (Rei is the only one that's not a bootleg). As I was typing this list, PGSM Luna and my Luna Pen arrived! JOY! ^0^ OMG wow talking Luna is so cute. She keeps asking me if I'm the Princess. :3 Does anyone know what kind of battery I should use in the Luna Pen? It says 1.5v. Is that the same as a AAA or is it a special kind of battery? YAY TOYS! 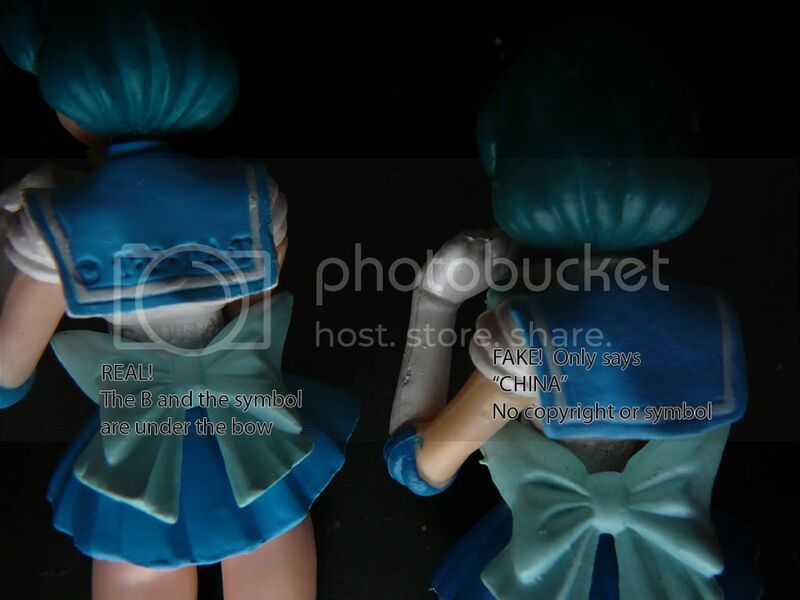 This blog is now located at http://blog.sailorastera.com/. If you are on the old URL you will be automatically redirected in 30 seconds, or you may click here. 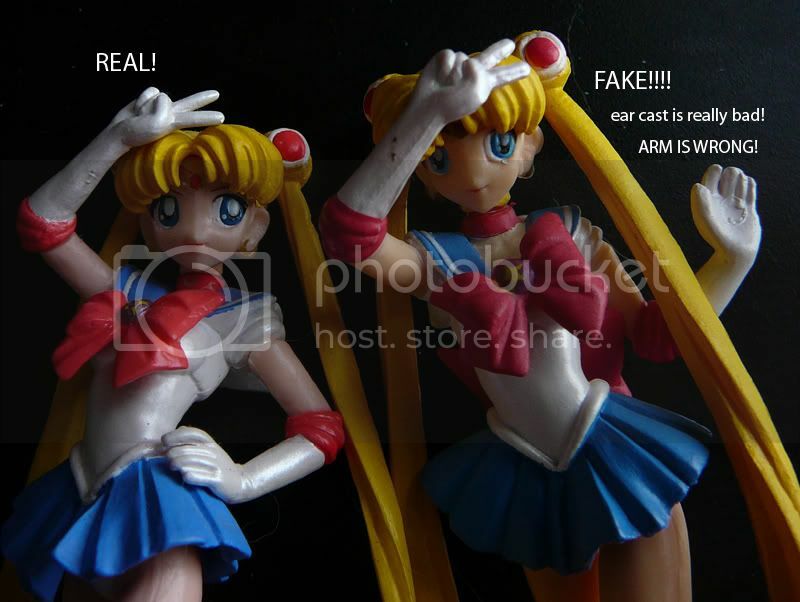 Sailor Moon Bootleg Gashapon + HGIF Figures! I've had a ton of bootleg gashapon. Most of the ones on eBay are bootlegs. How can you tell a real gashapon? First of all, if it's $0.99 for a whole set, then it's probably not real. All the Set #1 figures have imprinted marks on them that say "© T.P.TA.T" followed by four dots in a diamond shape, followed by: "B. CHINA"
Bootlegs are either missing PART of this, or all of it. I have some bootlegs that have the four dots and the "CHINA" but no "© T.P.TA.T" and no "B." I have some bootlegs that have nothing at all. NONE of my bootlegs have ever had all the required markings! the EYES. Real gashapon have nicely painted eyes and details that you won't find on the bootlegs, The bootleg eyes are poorly painted and smudgy. Other paint issues! Gashapon are tiny so the painting on them can be spotty even if they are real. 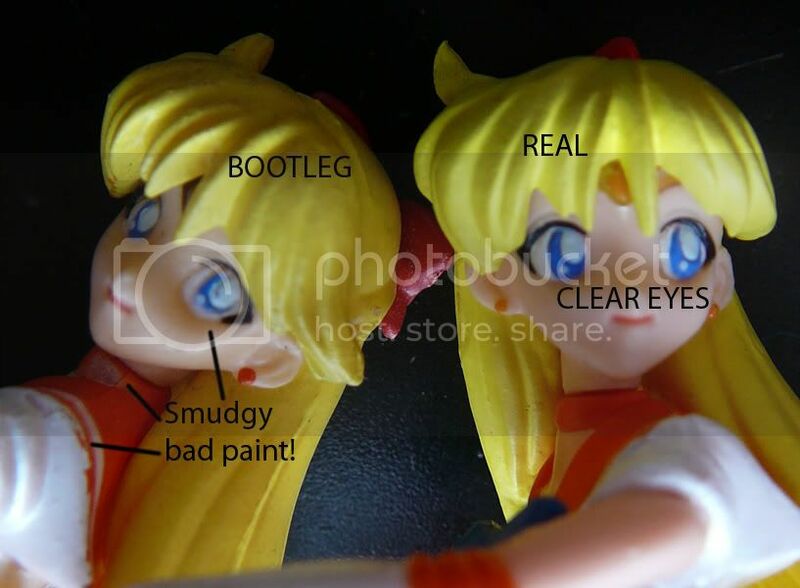 However, the bootlegs are noticeably worse sometimes missing paint on key elements of the outfit. Of course, in most pictures you won't be able to see these kind of details. But don't be afraid to ASK sellers, "Does this figure have these markings?" If they are too busy to look or answer then they probably aren't worth buying from anyway :P Please note, it IS possible for a bootleg to have all the markings. In that case, you will have to rely on the paint quality (which is sometimes spotty even on real figures) and the position of the limbs (which also can be a little wonky on real ones, unfortunately). Set #1 and Set #5 are the most frequently bootlegged sets. I have never seen a bootleg from Set #2, Set #3, or Set #4. 1) Each HGIF figure comes with a white, hexagonal stand. The copyright info "© T · P · T" appears on the underside of the base, followed by a series of numbers on the next line, then"B. China" and the four dots in a diamond formation seen on the previous figures. 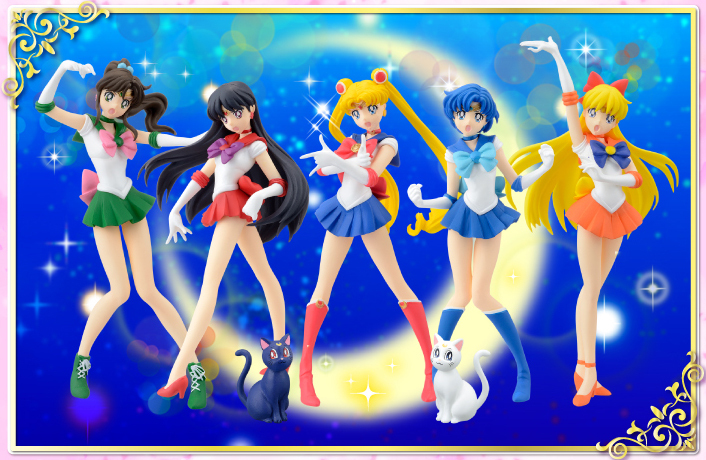 2) Each base has a number on the bottom that corresponds it to which sailor it belongs. 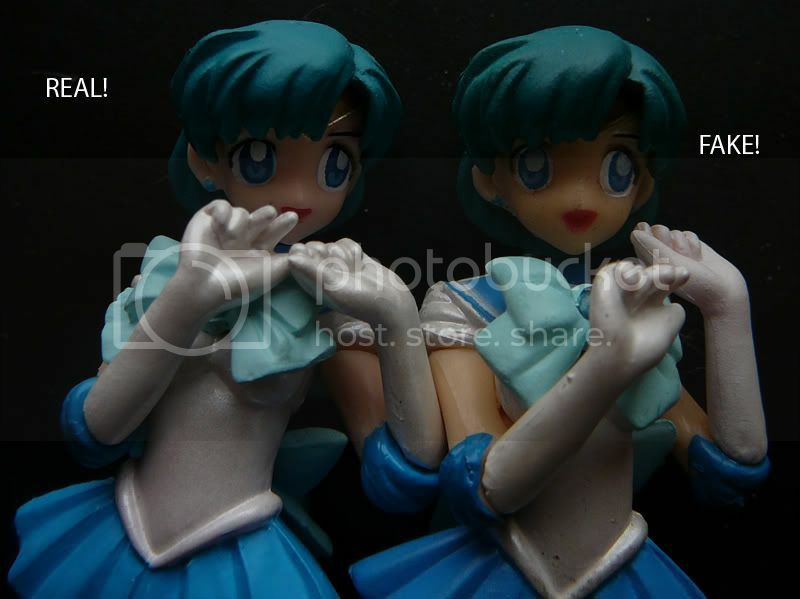 1 = Sailor Moon, 2 = Sailor Mercury, 3 = Sailor Mars, 4 = Sailor Jupiter, and 5 = Sailor Venus. 3) The stands have clear pegs that go up from the base and little clear cut out parts that attach to them to help support each character's legs. The pegs and support parts are imprinted with the number that corresponds to each sailor. 4) Each figure has a bit that comes out the torso and inserts into the legs with the skirt between. The bit that sticks out of the torso is marked with the number for the sailor. It's a big hard to see on some of them, most obvious on Mercury. Some are on the front, and some on the back. Some of the legs are marked, too. I didn't see marking inside Mars' legs and Moon's might be there but it's a 1 so it's a little hard to discern from just lines in the mold. 5) Most parts that attache to the sailor will have a number on it. For example, Venus' left arm says "5L" on the part that inserts into the torso. Her right arm says "5R" on the part that inserts on the other side. 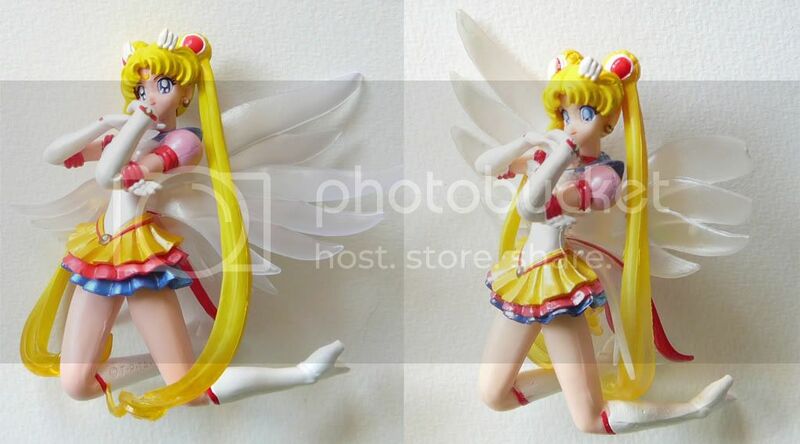 6) Some small parts like Moon's pigtails don't appear to be completely marked. 7) Mercury and Moon both have blue skirts so their skirts are marked with 2 and 1 respectively; the other sailors don't have markings under the skirt.